Naiche (1857?-1921) – Born into the Chokonen band of Chiricahua Apache around 1857, Naiche was the second son of Cochise and Dos-teh-seh, Cochise’s first and principal wife. His name means “the Mischief Maker” or “Meddlesome One,” a description he would earn in his own right as he led numerous raids against white setters. When Cochise died, Naiche’s older brother, Taza, assumed the role of chief, but died of pneumonia during a visit to Washington, D.C., as a delegate. In 1876 Naiche was made the last chief of the free Chiricahua. Initially he was peaceful and cooperative with the white settlers, leading the Chiricahua into surrender to General Oliver O. Howard in 1876 and leading his band to the San Carlos Reservation in Arizona. However, in the summer of 1881 news came of the first Ghost Dance, where the spirits of his father, Cochise, and other chiefs were said would return. That same summer, at the Battle of Cibecue, Arizona, a number of soldiers and an Apache medicine man were murdered. 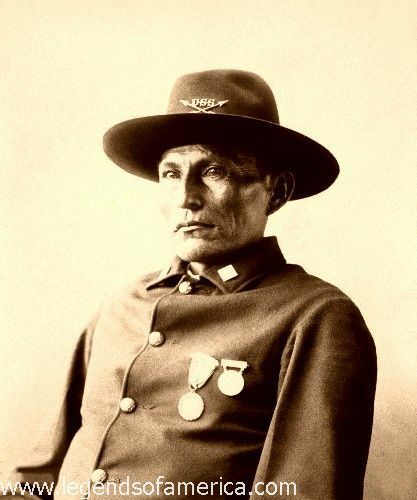 Troops then came pouring in and Naiche and his followers fled the reservation. They soon joined with Geronimo in the Sierra Madre south of Rio Grande, attacking both American and Mexican communities. Though Naiche was the hereditary chief of the Chiricahua Apache, Geronimo was viewed as the greater leader and Naiche followed his during these campaigns. The Army relentlessly tracked the rebellious Chiricahua Apache until Naiche surrendered on May 25,1883, to General George Crook. In January, 1884, Geronimo also surrendered. For a time, both settled at the San Carlos Reservation, but in 1885, the two leaders left with over one hundred men in a last attempt to avoid American control. By September 1886, Apache scouts and detachments of the U.S. Army were able to force their surrender in the inhospitable terrain of Sonora, Mexico. Afterwards, Naiche and Geronimo and their men were incarcerated first at Fort Pickens, Florida, while their wives and children were moved to Fort Marion. This was in part due to several prominent Pensacola citizens who had petitioned the government to have Geronimo’s group sent there in an effort to capitalize on his fame and attract tourists. President Grover Cleveland approved the petition for the men only, separating them from their families. After a while the US would reunite the families at Fort Pickens. All of them would later be moved to Mount Vernon Barracks in Alabama. After Kiowa and Comanche leaders invited the Chiricahua Apache to share their reservation, The US sent Naiche and 295 other Apache to Fort Sill, Oklahoma, on October 4, 1895. Naiche remained in Oklahoma until 1913, before eventually returning to the Southwest, where he lived in peace for eight years. He died of influenza at Mescalero Reservation, New Mexico, in 1921.